DigitalNZ brings together more than 30 million items from institutions such as Auckland War Memorial Museum Tamaki Paenga Hira so that they are easy to find and use. We added this one from this URL on 20 April, 2012, and last updated what we know about it on 20 July, 2018. This item is an image. It was created by an unknown creator on or around the date published: 1947; time period: 1945-1966. Exterior shop front showing display window. 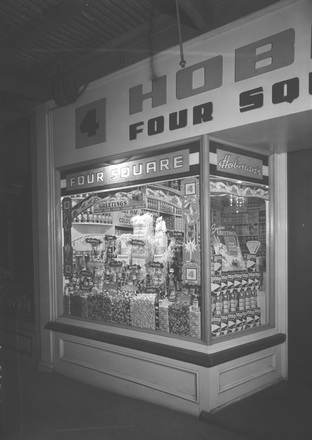 Hobman's Foodmarket, a privately owned Four Square store. 36 Stoddard Rd, Mt. Roskill, Auckland.